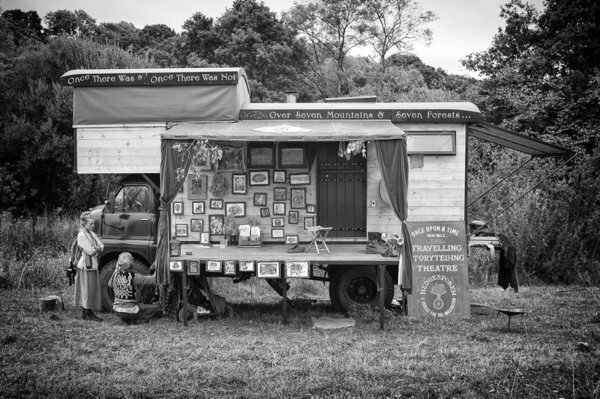 Hedgespoken is a travelling storytelling theatre built on a 1966 Bedford lorry, and sometimes home to Tom Hirons, Rima Staines and our young son. We travel and tell stories, play music, create and sell artwork and books, and steer a trail between the hedge and the crowd, aiming to inspire and make an old magic that touches hearts and imaginations wherever we go. Life on the road is not easy or straightforward, especially with a young child (and a new baby) in the family - we do not go to big commercial festivals to earn massive fees, and rely on putting out the hat at the end of performances. The truck is old and thirsty for fuel. In Winter, we return to a house these days, the better to make books and art to maintain the Hedgespoken coffers, but money is always in short supply. The truck needs maintaining, new Hedgespoken projects require funding, unexpected contingencies arise and we are constantly trying to find new ways of keeping our wheels rolling. We live frugally, but in order to make new art and create new shows and write new works, there needs to be more money in the bank. Can you help us continue our work with a donation or a monthly pledge? If you've seen us on the road or at a show, hopefully you'll agree that what we bring is worth keeping alive. Every penny is massively appreciated.